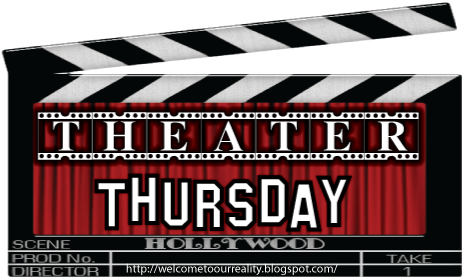 Welcome to Theater Thursday! Here at Crazy Shenanigans Thursday is movie day! I watch a movie that's currently avaliable to watch on dvd, netflix, amazon, etc then I review it and post about it. It's fun and you can even join in. Have a movie that you that you've seen and think others should see it too? Great! Write a grab my Theater Thursday button, write a blog post and then come back here and link up! It's always a fun read! Plus someone might be looking for something to watch! This week's featured movie is, Love Wrecked. Can you believe I had never seen this movie till this past weekend? I know right! It's got Amanda Bynes starring as Jenny, a Conneticut girl who's working for the summer in St. Lucia at a resort. She's also got her best friend with her, Ryan (Jonathan Bennett) to work along side. What she doesn't know is that Ryan has a major crush on her and has for awhile. She's just been too busy to notice because she's been obsessed with a world famous, rock star named, Jason Masters (Chris Carmack). While working at the resort, Jenny gets the surprise of her life when Jason stops over for a night at the resort. She's on cloud 9 and can't wait to try to talk to him. She even sneaks onto a night cruise just to try to meet him. Then the weather starts getting rough and Jason is knocked into the water and Jenny jumps in trying to save him. However, the boat gets further away from them and they wash up on a desert island stranded. The first day Jenny realizes that they are on the same island as the resort but on the other side. She decides to keep this to herself to try and spend time with Jason. Meanwhile the entire world is looking for them and Ryan is devastated thinking that something has happened to Jenny and he never got the chance to tell her how he really felt. If you've never seen this movie, watch it! If it you really liked She's the Man this movie is really similar to it and just as funny. Check it out! Oh Amanda Bynes, what happened to her? This movie is one that I have seen (you are not surprised are you?) and I do greatly appreciate it. I have seen this and it's definitely got Jennifer Bynes name all over it. Wishing you a great weekend sweetie!